Apple’s dominance as the top smartphone OEM in the US has started off strong in the first month of this year: 41.6 percent share. Samsung is once again gaining share faster than its main competitor, however, hitting a new high at 26.7 percent. Rounding out the top five were LG, Motorola, and HTC. In the platform wars, Google was still first with Android, and Apple took second with iOS. Yet Google’s mobile platform slipped at the start of the year, while Apple’s continued to plow forward. Rounding out the top five were Microsoft (which managed to sneak into third place), BlackBerry, and Symbian. The latest data comes from comScore, which regularly surveys over 30,000 mobile subscribers in the US. The market research firm says 159.8 million Americans owned smartphones (66.8 percent mobile market penetration) in January, up 7 percent since October. As you can see, Apple gained 1.0 percentage points in terms of smartphone subscribers (from 40.6 percent to 41.6 percent) while Samsung grabbed 1.3 percentage points (from 25.4 percent to 26.7 percent). LG gained 0.3 points (to 6.9 percent), Motorola slipped 0.6 points (to 6.4 percent), and HTC dropped 1.3 points (to 5.4 percent). As of late, this trio has been swapping places on the regulars as each tries to gain a foothold for third place. 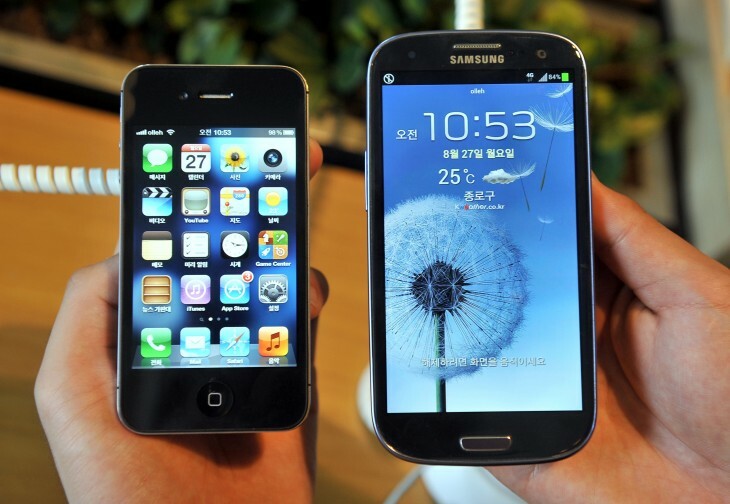 Samsung outgained Apple in more months during 2013, and it looks like the South Korean company is off to a good start to do it again. With the Galaxy S5 on the way, it’s likely the iPhone 5s and iPhone 5c won’t be able to hold it back; we’ll have to wait for the iPhone 6. HTC’s woes continue, and it’s doubtful the successor to its One smartphone can save the day. Motorola dropped into fourth place, as it tries hard to win consumers back with regular discounts. LG has managed to stop its own bleeding, but the Nexus 5 could be doing better. Google’s mobile operating system lost 0.5 percentage points (from 52.2 percent to 51.7 percent). Apple meanwhile increased its share by 1.0 percentage points (from 40.6 percent to 41.6 percent, just like for its smartphone share). BlackBerry was down 0.5 points (from 3.6 percent to 3.1 percent), Microsoft stayed flat at 3.2 percent, and Symbian stayed at 0.2 percent. Windows Phone may have taken third away from BlackBerry OS, but not because the former gained share. The Android-iOS duopoly in the US stayed at the high it ended at in 2013 (93.3 percent market share).